Uniquely styled half eternity ring, set with a mixture of invisibly set princess cuts and baguette diamonds across a 3.9mm band. 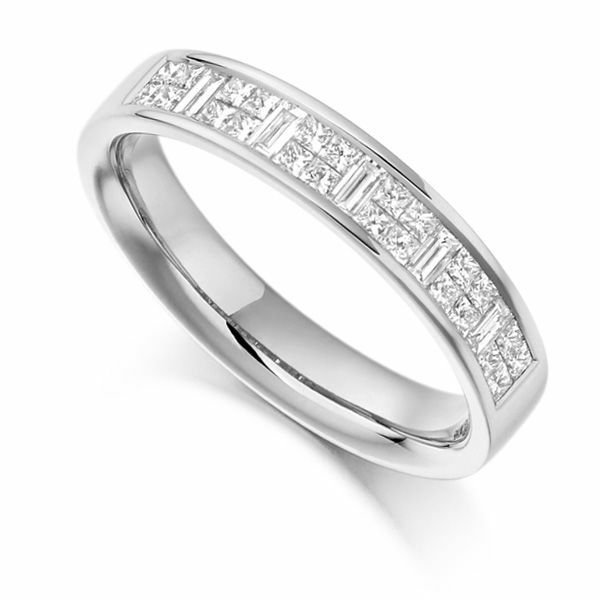 This skilfully crafted half set Eternity Ring is set with Baguette and Princess cut Diamonds which are graded F/G in Colour and VS Clarity for incredible purity. The Diamonds have been hand-selected into this invisible channel setting, they are securely held across the top half of the comfort fit band. Available in a range of precious metals including 18ct White Gold, 18ct Yellow Gold, 18ct Rose Gold, 950 Palladium and 950 Platinum. With the added reassurance of 60 days return, a lifetime warranty and an insurance valuation. Please allow 3-4 weeks for this beautiful ring to arrive at your door in our luxurious packaging.